Rooftoppers is trusted by many large corporations, property management companies, hotels, condominiums and homeowners alike. We have a well-maintained fleet of trucks with state-of-the-art equipment to get your project done and get it done right! We have proudly served the Los Angeles, Orange County, and Ventura, California area for more than 33 years from the same location. And our sales and supervision team has over 100 years of combined experience in the roofing industry. Additionally, we are also a Golden Star Applicator of Certainteed built-up and modified bitumen roofing systems, which is a distinction most other roofers can’t say they have. The majority of our business, 80 percent, in fact, is either repeat or referral business, which is a huge part of our success. Every project is directly supervised by a management team member to ensure consistency and to help avoid problems that could cause costly delays. We pride ourselves in providing not only top quality products and services, but we also take pride in delivering exceptional customer service. And we do that by treating everyone the way we would want to be treated ourselves. That means you can be sure when you’re working with Rooftoppers that you and your project will be treated with all the care and respect you deserve. Your home is probably one of the largest investments you will make in your lifetime. So don’t settle for just any roofing contractor. Take all the time you need to find a local company who will be there for you now and well into the future. Rooftoppers has been in business since 1983 and has operated out of the same location since its inception. 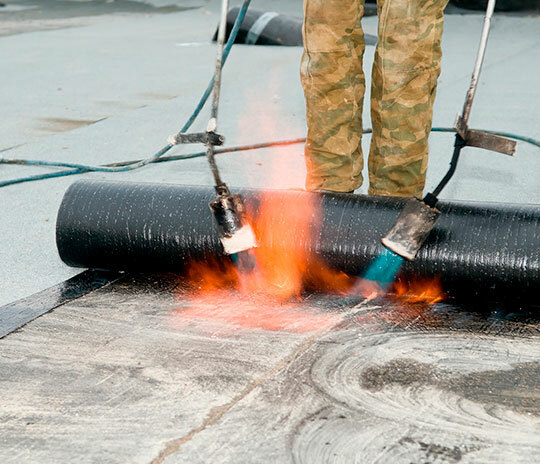 Modified roofing, also commonly referred to as polymer-modified or modified bitumen (MB), are sheet membranes that were originally developed in Europe during the 1960s and have only been used in the United States since the mid-1970s. Modified bitumen roofing consists of a one-, two- or three-ply system and is an asphalt-based product that is generally used on low-slope buildings or flat-roof structures. They can be installed by heat-welding, using hot asphalt or a cold-process adhesive. A modified bitumen roofing membrane is a high-performance solution for a variety of commercial building applications and comes in several different options.